A. I'm Crystal Hanehan of Vintage by Crystal. 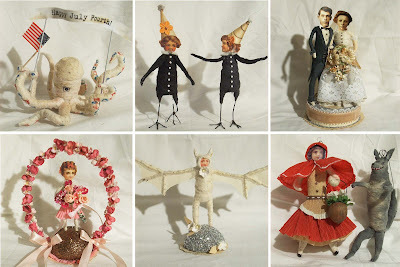 I make whimsical, vintage inspired figures and decor for the holidays and for everyday that are reminiscent of Grandma's old ornaments from Germany. 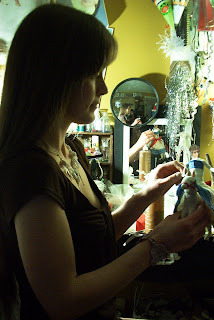 I specialize in spun cotton and fiber sculpture and use vintage materials wherever possible. I live in Boston, MA with my better half Ben, kitty cat Magic, birds Sam and Michelle and fishies Frasco, Little Guy and Blue. I have a spare bedroom that I call "my studio", but "my cluttered hole" is a more fitting name. lol I'm obsessed with all things old and worn out and spend a lot of my free time scouring garage sales and flea markets for vintage treasures. I've even been known to pick up rusty lost earrings, buttons and random doodads from the sidewalk (but don't tell anyone!). A. I grew up on a dairy farm in Saratoga Springs, New York, where my family still lives. My father is of course a dairy farmer and taught me so many useful things about building and creating things and about business. My mother is the total opposite of my Dad. She's much more free-spirited (and won't touch paperwork with a ten foot pole) and is an amazing self-taught artist. I owe her my artistic skill and passion for arts and crafts and for old vintage and antique treasures. I was home schooled for most of my elementary education and graduated high school at 16, after which I went to 3 different colleges before graduating with a BFA in Graphic Design at SUNY Oswego. I currently work full time as a Graphic Designer for a prominent Boston real estate development firm. My day job has a great work environment and allows me to interact with people on a daily basis, but creating maps and touching up bad photos of commercial buildings is not entirely the creative career I was hoping for, hence my intense concentration on building up my more creative Vintage by Crystal business! Q. Apart from creating things, what do you do? A. It's hard for me to do anything but create to be honest. When I'm not at work creating boring lease proposals and not in my studio creating funny bunnies...I'm rearranging vignettes around the house or out at garage sales and flea markets looking for things to decorate the house with or to use in my next project. I do enjoy being outside...camping, hiking, barbecuing. I also love fairs and science museums and anything new to discover. My guilty pleasure is hoarding country decorating magazines...so much inspiration! Q. What first made you want to become an artist? It started very very early on. One of my earliest memories ever was when I was just 3, maybe almost 4 years old. I was always coloring in coloring books. I had Barbie and Gem and Chip and Dale. I always worked diligently and tried my best to make a handsome picture. One day I was coloring in my Moon Dreamers coloring book and I wanted to test my mom. I took a blue crayon and scribbled over the whole page...what a mess! Then I went to my mom and asked her if she liked it. I remember her looking at it for a split second and saying "wow, that's beautiful." Needless to say, Mom failed the test. I knew she didn't think it was beautiful. I did however continue to ask for her opinion on my artistic endeavors. Later on I was always drawing mermaids and centaurs. Then it was animals. Then I took on portraits. The older I got, the more advice she gave me and the more she taught me. Now I talk with her over the phone about ideas and sometimes we collaborate on pieces. One day I hope to have a full blown collaborative business with her! Check out Crystal's work at www.vintagebycrystal.etsy.com or www.vintagebycrystal.com.